Hope you're all well and enjoying the run-up to Christmas. This week's playlist is a quieter one again. I reckon these grey and cold November days are just the right setting for some quiet, somehow mysterious and beautiful music. 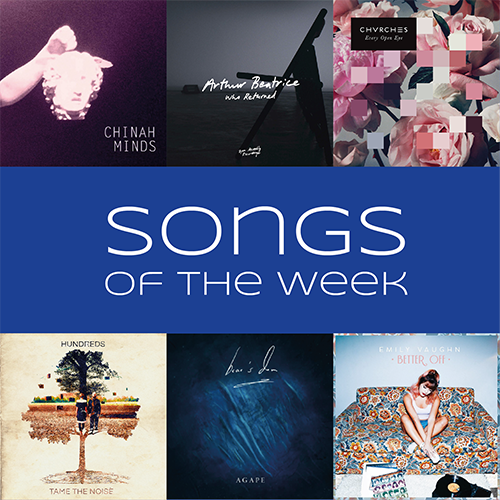 So without further ado, here are this week's Songs of the week. CHINAH stands for electronic pop combined with some R&B vibes. They're a quite new band from Copenhagen in Denmark. Minds is their newest release and is a suspenseful track. I really like the synths compared with the spicy rhythm and the smooth vocals. This November it was also time for something new from English indie rock band Arthur Beatrice. Their music can be described as contemporary art, as they experiment with loads of new sounds and there's always something very special about their music. I really liked they last album Working Out, and the new material doesn't disappoint. Who Returned is simple and beautiful song. This one is the song to cheer you a bit up again. I don't want you to get depressed or something like that. In September this year Scottish band CHVRCHES have released their second album Every Open Eye. Empty Thread is one of my favourites from the album. It's a casual and powerful synth pop track with great lyrics. And as a side note the video for it is really good as well. Fly Birdie Fly. Fly Birdie Fly. This line has been floating around my head since last Monday. The German electro pop duo Hundreds were supporting Alt-J on their German tour dates, therefore I heard them play their set on the concert last week. It was super nice and I enjoyed it. Agape is one of these songs you hear the first 15 seconds and fall in love. And it gets even better when the vocals set in. It's the first song of Indie/Folk band Bear's Den beautiful album Islands. Words that come to my mind when I listen to the track are poetic, dreamy and melodic. The perfect soundtrack for wintry daydreams. And last but not least another dreamy and catchy tune by alternative pop artist Emily Vaughn. Her sound reminds me a bit of Taylor Swift's latest works, which I really liked. The newest single Better Off is a bit sassy and edgy and fun to listen to, even though the topic isn't exactly fun. It's an upbeat breakup song (I did mention the Taylor Swift semblance, didn't I?) and it's an "anthem of independence", says the singer-songwriter from Florida. That's another addition to your music repertoire sorted. As always you can find the SOTW49 Playlist on Spotify. And if you like the songs I've been picking during the past weeks, feel free to follow my Songs of 2015 Playlist. Of course I'd also love to hear your suggestions for future playlists, hence if you know a great song, let me know either in the comments, via email or on Twitter.